EDIMAX Technology, a leading provider of advanced network communication products, today has proudly announced about their fastest growing acceptability and demand for their universal Data card supported 3G routers. These routers are compatible with all the data cards present in the market despite the ISPs they belong. The demand has increased across the IT, Security & Surveillance, and SMB segments. The highest ISP data card support guarantee and unique easy installation process has made Edimax 3G routers most widely accepted in the industry. Friendly technical team guides the users for quick installation and how to manage internet bandwidth effectively. 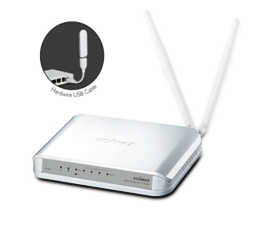 Edimax 3G routers are compatible with any data card of any brand available in the market. Edimax' 3G - 6408n, the latest model launch stands out to be the best 3G router in its segment. It supports both 3G/3.75G and cable/xDSL modem. Users can also use the device to share an iPhone's 3G internet connection by enabling the internet tethering function on iPhone and connecting it to the 3G-6408n via USB, designed with latest green WLAN technology. With 300Mbps Max Wi-Fi Speed, Edimax 3G-6408n route is a high-speed solution that complies with IEEE 802.11b/g/n standards. The latest wireless MIMO (multiple-input and multiple-output) technology is built into this router to broaden its Wi-Fi coverage and to eliminate dead spots within the signal range. Eric Yang, Country Manager - India at Edimax Technology said, "We are proud to announce that our Edimax 3G routers are compatible with any data card of any brand. We welcome challenges from any brand that manufactures data card regarding the 3G router compatibility. We are thankful to all Indian consumers and channel partners for contributing in the achievement of the highest sales of Edimax 3G -6408n, which is the best among all our routers. With the increasing demand, we look forward to adding better feature rich products to meet the increasing needs of the customer." Founded in 1986, Edimax Technology is committed to providing premier networking solutions to consumers and enterprises. Edimax has a global presence with over 14 regional offices in the US, and the UK, Germany, and Taiwan (Taipei) and has been listed at the Taiwanese Stock Exchange since 2001. Edimax's complete product portfolio fulfills all the connectivity needs of any network architecture or application requirement. Product availability may vary according to region. Please contact Edimax offices in your area or visitwww.edimax.com for more information. "We are proud to announce that our Edimax 3G routers are compatible with any data card of any brand. We welcome challenges from any brand that manufactures data card regarding the 3G router compatibility. We are thankful to all Indian consumers and channel partners for contributing in the achievement of the highest sales of Edimax 3G -6408n, which is the best among all our routers. With the increasing demand, we look forward to adding better feature rich products to meet the increasing needs of the customer."